Custom Protect Ear is the largest personalized hearing protector manufacturer in North America. The dB Blocker™ Discreet Non-Vented solves one of the most important health issues facing many people today – lack of deep, uninterrupted sleep. The dB Blocker™ Discreet is a custom earplug specially designed to provide you with effective hearing protection and be comfortable in any sleeping position. dB Blocker™ Discreet is a hearing protector that is actually comfortable to wear. Most hearing damage arises when an ear plug is removed for conversation and comfort. dB Blockers™ are made to fit the individual’s ear exactly and stay in place without applying pressure to the ear so comfort is not an issue. 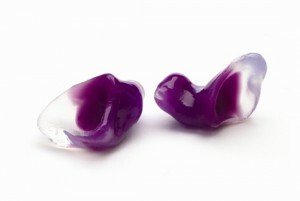 This gives the wearer a product that provides effective hearing protection and stays in the ear all day (or night) long. The Non-Vented dB Blocker™ Discreet was designed for people who do not need to communicate when in noisy environments; however they do not prohibit the wearer from hearing important sounds such as an alarm clock. They are also suitable for executives and supervisors who visit the factory floor infrequently and do not need to communicate while in a noisy workplace. Using dB Blockers™ will enhance worker compliance with your Hearing Loss Prevention Program, because they can be worn for a complete shift, without the need to remove them to perform tasks, eat lunch, or relieve pressure. Anytime a hearing protector is removed, even for a short period of time, you are exposed to damaging noise. Noise exposure is cumulative. dB Blockers™ are much less expensive to use than disposable earplugs or muffs. You can save up to 60% over 5 years on a program when an entire facility is fit. The cost per month for dB Blockers™ is lower because you can wear them for 5 years. Ask us to show you how dB Blockers™ can be a cost effective solution for your hearing protection needs. At Custom Protect Ear we provide specific warranties for our customers: FitRight Guarantee & Product Warranty. The use of this hearing protector is not limited to the above applications. THE SMARTEST HEARING PROTECTION IN THE WORLD.